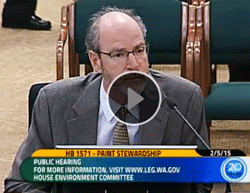 Substitute House Bill 1571 passed out of the House Environment Committee on Feb. 12, 2015 with an amendment to exempt the paint stewardship assessment from the B&O tax; watch TVW video of the Feb. 5 hearing (~40-minutes). On March 5, Engrossed Substitute House Bill (ESHB) 1571 was pulled from Rules and passed a House floor vote by 60-38, and now awaits consideration by the Senate. 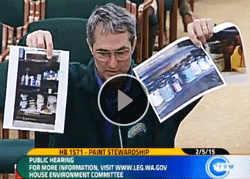 The bill is a reasonable approach to implementing a paint recycling program led by the private sector paint industry. The paint industry is motivated to run the most efficient program possible and is best suited to manage paint which is a product they deal with on a daily basis. ESHB 1571 creates an industry-run program, part of a uniform system operating throughout the country for the proper recycling, reuse and disposal of leftover paint. Eight other states, including Oregon, have passed similar legislation initiated by the paint industry. Paint retailers in Oregon are pleased with their program and find that it brings business in the door when people drop off their paint. 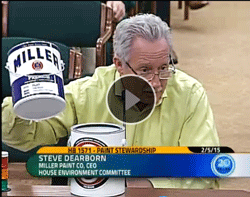 Steve Dearborn, CEO of Miller Paint Company, with stores in Oregon and Washington, called it a "retail driver of traffic to our stores" and went on to say that "if the state of Washington adopts this bill, Miller Paint would be interested in becoming a processor [of recycled paint]; it would add probably 25 to 30 jobs; it would keep all that recycling within the state and add jobs here in the state of Washington..." when explaining why he supported the bill. Visit the NWPSC's WA Paint Activities for more information.